Sweet and fruity in the nose, we smell apple cider, rich berries and hints of bright grapes. The full and heavy body is laced with hints of dryness. The flavor offers variety, from grapefruit and baked berries to milk chocolate to cedar. From brown sugar sweetness to smoked nuts, this coffee has a lot going on in it. The finish lingers long, starting with raisin and dark chocolate fading to a nutty dryness. 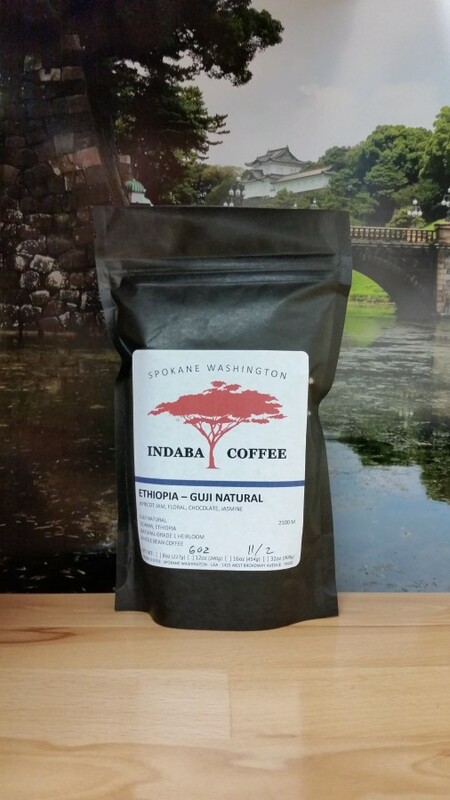 Indaba Coffee is a social benefit coffee company that started in 2009. We currently operate two locations in Spokane, WA. Our vision is to provide supportive employment to the marginalized population, internships to at risk youth, and a meal for every bag sold. Our roasting philosophy is more modern and takes after the Nordic roasting style. We want to feature the uniqueness each coffee has to offer. Categories: Coffee Ratings. Origins: Ethiopia. Flavors: Baking Spices, Berry, Brown Sugar, Cedar, Creamy, Dark Caramel, Dry, Dry Cocoa, Grape, Grapefruit, Nutty, Raisin, Smoky, and Stewed Fruit. Brew Descriptors: Dry, Fruity, and Nutty. Roasters: Indaba Coffee Roasters.